Your prints will always be charming when you choose the right cartridge for your printer. Don’t kiss a frog in a hope that it will be alright, but embrace the best with a genuine HP 564XL (CB322WA) Photo Black Ink Cartridge. Order your genuine Photo Black Ink Cartridges now from CartridgesDirect to get prompt delivery. CartridgesDirect – we work harder to make your printing easier. footnote5 Approximate yield of 4x6-in color photos. Tested in HP Photosmart D5460 Printer. Average based on HP testing methodology and continuous printing. Actual yield varies considerably based on content of printed pages and other factors. For details see http://www.hp.com/go/learnaboutsupplies. This was my 2nd purchase and as with the 1st it was a pleasure to do business with Cartridges Direct. Keep up the great work. Colour not as bright as usual. Excellent service when ordering on and quick delivery. Very happy with the service from Cartridges Direct. No hassles, and prompt services. Cartridges arrived well packed, very happy! This is my second order. Both orders received prompt attention, were delivered within a couple of days and cheaper than the equivalent inks in the shops. That is IF you could get them in the XL size. I have no hesitation in recommending Cartridges Direct. Excellent fast postage and ease if ordering. I got the products I want really fast. thank you! This is a wonderful service to be able to purchase ink cartridges online, and have them delivered in a timely manner at a reasonable price. 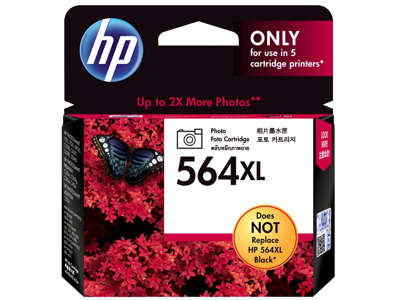 The HP 564XL cartridges I purchased were a replacement for some I ordered in error. I was most impressed by the help I received from Cartridges Direct and the speed with which the replacements were despatched, at no extra cost to me. Hassle free . easy ordering .arrived on time . good price . will do it again ! thank you. Good quality product, fast and free delivery.